April | 2014 | and a beauty to you! One of the wines I remember from my childhood is Soave. I know a bit about the wine now, but back then I mostly knew the name everyone used to refer to the tall green bottle; soave bolla. I am sure it was a marketing twist to get Americans to say the name of the wine before the name of the producer. I mean no one says Chardonnay Kendall Jackson or Cabernet Mondavi, but everyone said Soave Bolla almost like it was one word. The story of the Bolla family, and this wine go back to the small town of Soave in the region of Veneto where the family operated an inn and restaurant that featured their own house made wine. Veneto is a wine region in north-eastern Italy. They began exporting their wines to the U.S. in the late 1940’s. By the late 1970’s sales were booming and Bolla’s most popular white wine, Soave, was selling almost a million cases a year. In the same way Bolla’s commercial version of Valpolicella hurt the fine wine community’s impression of Valpolicella, the same is true of Soave. 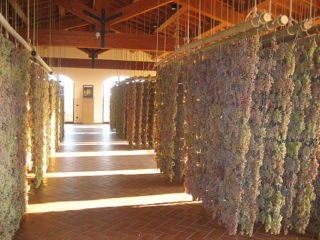 Sales of all Soave are affected by the commercial story told above. 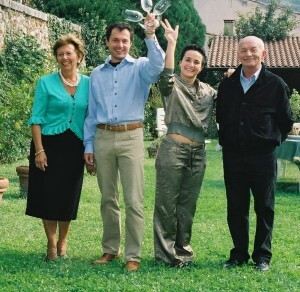 Soave and Valpolicella have made a comeback and established a very different reputation, thanks to small family run estates producing these wines. I want to offer you a taste of each of them this Thursday, May 1st, at Parker and Otis. I will be pouring Coffele Soave Classico and Tezza Corte Majoli Valpolicella. Both are excellent values – if you have only ever tried the Bolla version of Soave, I would like to give you a chance to taste a real wine that will change your impression of what these wines can be. The wine is a fresh, crisp white that pairs well with foods like shellfish or risotto, but is also an excellent aperitif. Made from 100% hand picked Garganega. This wine is beautifully balanced with a backbone of minerals and crisp finishing acidity. The winery is located in the heart of the old town of Soave and has been described as “the little winery that could” because the family has steadily improved the wine to the point that today their Soave is famous. As you know, I am a “championer” of little wines that could! Especially if they tell a story in the glass! I once heard a guy say in the middle of the summer that he was going to turn the “ac” down low and enjoy some red wine this evening. If you choose a more appropriate red in the summer, cranking the “ac” won’t be necessary. A few things to bear in mind when selecting a summer red- you want the wine to be refreshing. You can put the wine in the fridge for 10-15 mins before opening to get it under 60 degrees (certainly under 70). I prefer a lower alcohol red in the summer for many reasons. A red that is low in tannin and light body- these things joined together make for a refreshing summer red. Restauranteurs won’t like my next paragraph, but I’m going to say it anyway. Some restaurants are lucky and have a climate controlled space for their red wine storage, but some do not. Often wine is stored wherever there is space. When I order a red at a restaurant, I always feel the bottle. This request produced some embarrassing moments for my daughters when they were growing up. The server would most often say “sir, but it’s a red wine, it’s supposed to be served at room temperature.” I prefer my red at much less than 75 degrees. I ask the server to put the red wine on ice for a few minutes to bring the temperature down. There are many bottles at Parker and Otis that fit the summer bill. The one I will be pouring this Friday is a special one. Please meet Grignolino from La Casaccia. It fits all the parameters that I describe. It has a dashingly delicious complexity of flavors that dance on your tongue. This wine comes from the alps in Northern Italy. This wine is powerful in a different sense. The elegance of this wine is powerful. Jay Murrie of Piedmont Wine Imports has brought this beauty to us! I love red wines from this area of Italy. The Ruche varietal is also from same regions. These mountain wines seems to have a uniqueness that I love… particularly in the warmer weather. I will be pouring this wine from 4:00 to 6:00pm this coming Friday, April 25th, at Parker and Otis in Durham. It’s a beauty! Join me to taste for yourself! Come taste this organic beauty with me! 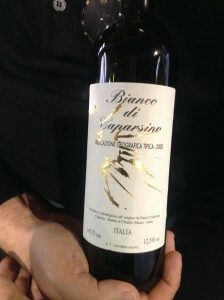 I will be pouring 2008 Bianco “Di Caparsino,” a special white wine from the heart of Tuscany today at Parker and Otis from 4-6pm. Tuscany is mostly known for Chianti and other reds made from the Sangiovese grape. This wine that I have chosen for Friday is mostly Trebbiano, with a smidge of Malvasia. It’s a beauty! Given the weather forecast for this weekend, I think this will make a fine wine because of its weight. It has a little more body than many white wines have. 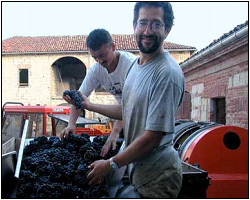 The wine maker doesn’t rush this one to the market, he waits until the optimal time to take it out of the barrel. This is what gives this wine some weight. It has just the right amount of weight in the mouth, yet has a refreshing and light quality. It will pair well with ham and biscuits for Easter brunch or be a fine wine for sipping with cheese pre-Easter dinner. 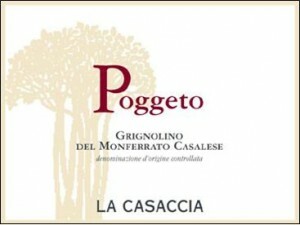 Paolo Cianferoni is the wine maker of this beauty. He follows organic farming practices on his estate. This estate has supplied me with my house red in the coolers months of 2014I think I will be drinking their white during the warmer months. I really like the flavor. There is enough texture to have a glass before dinner. There is a complexity about the wine that makes it taste more expensive than you have to pay. Don’t we all enjoy a great value? 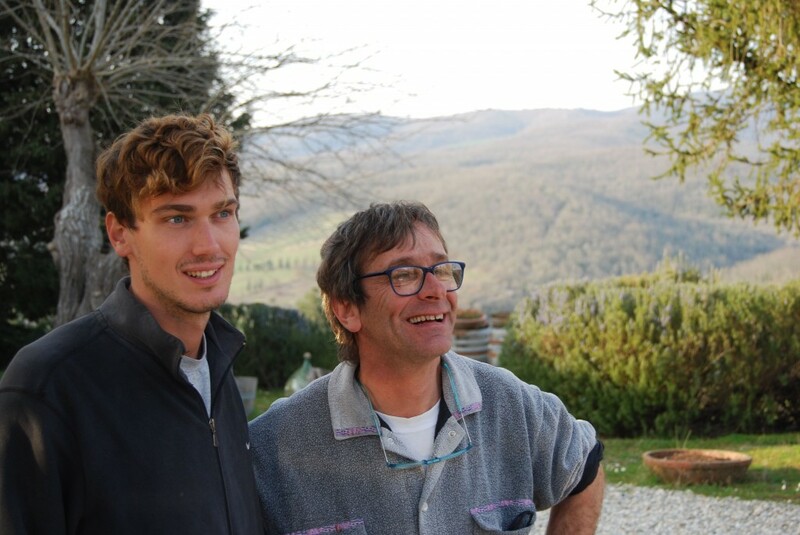 Because of the organic wine making practices that Paolo Cianferoni embodies on his estate, you can feel even better about drinking his wine. I like what Laura Collier has to say about drinking organic wine in an article from the Organic Wine Journal. She expresses very well my own feelings about naturally produced and organic wine making. I will share with you more about my personal perspective in next weeks post. The wine we will be tasting next week is also made with organically grown grapes. Stay tuned! Come taste this beauty for yourself! I would love to assist you to choose wines to match up with your Easter meal. If you have any other Easter needs, Jennings Brody has the best selection of Eastery treats in town! There was a time when I couldn’t sell a bottle of pink wine. Thank goodness for us all that these times have changed! My mission has always been to promote wines that are created by small farmers in their own cellars from their grapes grown on their properties vs. the large production of wine factories. Many people are beginning to appreciate supporting the importance of small growers and wine makers. You could say that there is a story in every sip that you will taste from wines made from the producers that I love! I have chosen two rose` wines from small producers for the tasting I will be doing this coming Friday, April 4th from 4 to 6pm at Parker and Otis in Durham, NC. One rose` is from Spain the other is from New York. Both wines are a great deal for less than $20 a bottle. When you know -like I do, the hand labor that has gone into crafting real wines like these (there’s really not a good word to describe this, some call them natural wines). It makes your realize that the price is a good value. Value does not always mean $2.99. What is happening with this appreciation for the small producers is that there is more demand for the smaller producers’ wines. This is good and this is bad. It’s good that the wines that I like from small producers are being well supported. It’s bad because there is not enough wine to go around. When there is greater demand for wine than there is supply, it goes into a category called allocation. One of the wines that I will be offering at Parker and Otis this week falls into the category of wines that are allocated. I will be pouring Ameztoi Rosé Getariako Txakolina. This is most often referred to simply as Txakoli (chak-o-lee). I love the flavors of this wine, the refreshing quality it brings to the palate, the light spritz, and the low alcohol content. I can’t imagine a better wine for summer weather. I am going to warn all of you who will love this wine – get ahead of the game and pick up more than a bottle or two. I had friends who were sadly disappointed last July when they realized that all of this spritzy summer wine had been quickly cleared off of the shelves. Friday we will have less than 50 bottles of the Ameztoi available. This wine has been allocated. We must raise our glass to fellow Chapel Hillian, Andre` Tamers of De Maison Selections for putting the Ameztoi Rose` on the map. It’s his responsibility to figure out how to allocate less than 5,000 cases of the cult-followed wine around the country. Andre` buys the entire production of this wine That’s quite the job. Now if you had told me a few years back that these wines would be in such demand, I am not sure if I would have believed you. I have been promoting wines like this rose` all along. A piece that I wrote a few years ago began with the sentence “rose` has a terrible image,” but it seems that is no longer the case. The rose`s like the one’s from Neal Rosenthal that I so enthusiastically supported in years gone by, are so popular now that I can hardly get my hands on them today. We’ve come a long way baby! These pink wines of Europe are off to the races! Rose has survived and surpassed the identity crisis it went through in the 80’s that was evoked by the popularization of White Zinfandel. These pink hued wines are in high demand. For the first time ever, people who want to open a bottle of rose a couple times a week are going to have to think ahead. I suggest buying more rose` than you will need for dinner tonight. Would you like some assistance planning your spring and summer of rose`? It would be my pleasure to assist with your stocking-up plan. 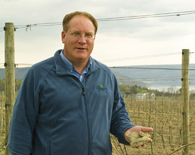 In addition to the Ametzoi, I will be pouring a Pinot Noir rose` from Dr. Konstantin Frank from the Finger Lakes area of New York State. Jennings Brody, the owner of Parker and Otis, gave me a bottle of this wine to taste. She has named this rose` as the wine she will be drinking all summer long, with good reason! It is no coincidence that I have loved many roses over the years. Some of the ones that I have enjoyed the most are made from the Pinot Noir grape. This wine whispers deliciousness from the fruit amplified by a slight hint of sweetness. It has a bright finish the makes it an excellent food wine. I am curious what it will whisper to you. Join me Friday for a taste!